I love Americans, I’ve even been in love with a few of them, they are good-hearted human beings, for the most part, like most people, for the most part. I love Russians, I am the son and brother of Russians, they are good-hearted human beings, like most other people. I’ve never lived in Russia, I’ve never experienced their day-to-day life, their culture first hand, their language surrounding me, their food for breakfast, lunch and dinner, their entertainment and advertising filling my waking moments. But I’ve done all those things in America, I’ve been doing it since 2011, for the most part in New York City, these days in Fort Collins Colorado. I’ve experienced a large spectrum of American life for long enough now that I attribute a lot of my hopes, fears, and weird ways of saying things to being a true blooded Ameristralian. I love Americans, but I feel very sorry for them, I feel very sad and hurt for them, I’ve felt their systems of oppression crush me, like it crushes them; unbelievably high medical bills (even when I had top-tier insurance), unwarranted electrical bills (that weren’t mine), ruthless debt collectors (again for debts that weren’t mine), the constant background noise of overwhelming media stations that lie, fear-monger, and spread hate, and election systems that ignore the wish of the people to protect undeserving and corrupt power. I’ve felt it all so bad that I just wanted to shut down, shut it all off, end it even, like so many distraught Americans do, so often these days. I have experienced the learned-helplessness, the dysphoria of realizing that you’re living in a hypernormalised reality, and the despair at the realization that if “things” continue the way they’re going, we’re all going to die. 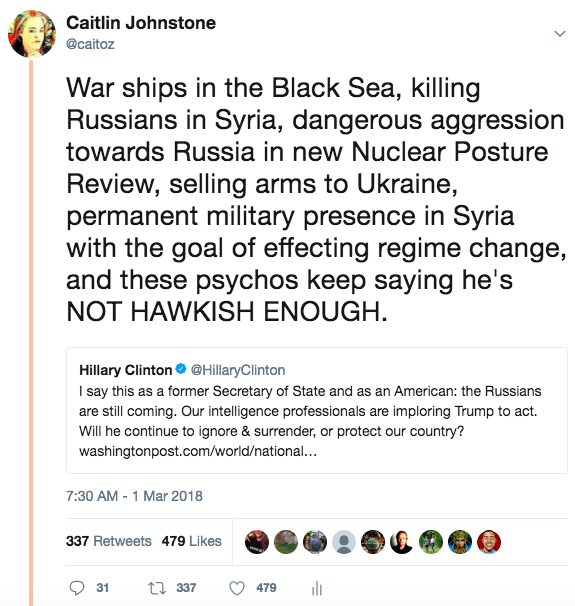 But when it comes to this Russia narrative, I’m not susceptible to the propaganda like so many Americans are, and when I see things like Hillary Clinton pushing for even more violence against Russia, I get furious, and scared. 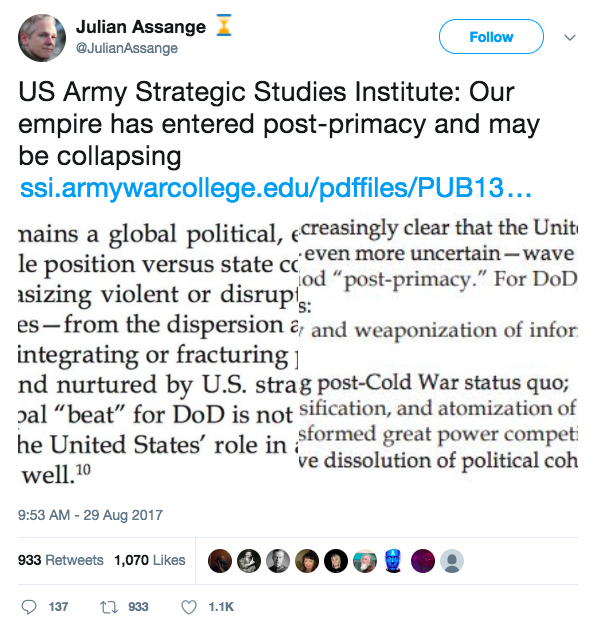 So does the rest of the world, so does Caitlin Johnstone, who once again is calling out this psychological exploitation of the American people in her article The US Empire is acting like a desperate, cornered animal, because that’s what it is. The notion that the “collusion” between Trump and the Russian government is manifesting as consistently mounting aggressiveness directly against one another’s interests is laughable. It is laughable, it’s insane how ridiculous the narrative is, but not on the streets of America, not with “most Americans”. Not because most Americans think that there is collusion between Trump & Russia, most Americans are just confused, they can’t keep up with it, is Syria the bad guys? Are Russia helping the bad guys? Because most Americans don’t get it, their mind can’t make that shift, to realize they’re ruled by bad guys. The failing capitalist American Government / Military / Corporations are the baddies, they are the enemy to all life on Earth, risking Global Nuclear War while ignoring the threat of Climate Change. The destructive evil of the American Empire threatens the survival of all life on Earth. The reason this once well oiled machine is acting so destructively, being run by such an obviously horribly unfit Trump who beat another obviously unfit Clinton, after an election that could be at best described as rather entertaining, but nothing like a democratic one, is because it is falling apart. Like Rome, which they modeled themselves off, their empire, their dominant control, is falling apart; depleted of all its resources, its manufacturing industry exported abroad, its education system gutted, and its healthcare system failing to provide; America relies on financial trickery, intimidation and violence to hold on to control of the world economy, and it’s losing grip. Don’t believe me, think this is hyperbole? US Army Strategic Studies Institutes is going to disagree with you. Yeah that is the American military admitting that the US global hedgeonomy is failing, and that this change from the US dominating the Earth will fundamentally change life in America for Americans, both rich and poor. Many, many powerful people have built their kingdoms upon this vast empire, and now that empire is approaching post-primacy. Staying on top of the world and preventing the rise of any rival superpower has been a mainstream tenet of the US-centralized establishment for a long time now, and that appears to be the goal behind all the moves that they are taking to disrupt the Russia-China tandem as well. But they are fighting backed into a corner, and they are getting desperate, and they are overextending themselves. Which is why they look so ridiculous and obvious to anyone who is paying attention. What does this mean for the American people that we love? It means that it is up to them, to seize control of their government, to change the direction of their nation so that its vast wealth and power can be used to help the people of America, instead of killing the people of the world. I spent tonight at Fort Collins Mennonite Fellowship helping locals who are sleeping rough enjoy a meal, shower, and some peace on their Friday evening. I joined fellow Fort Collins Democratic Socialists of America as well as Colorado State University Students to spend the night giving help to our fellow people who are suffering under the regime of evil. Tomorrow our DSA chapter will meet to discuss our current focusses of canvasing for Medicare For All, applying pressure to candidates of Colorado Governor during question sessions, doing the same to local Chief of Police candidates, and creating a culture that invites people into thinking about their position in American society, and subsequently how they’ve can improve their lives by changing the structure and controlling interests of their society. This is what Americans need to be doing, they need to be reaching into their community, and sharing love with one another, uniting together to fight the government which oppresses them to maintain its power oppressing everyone else. Stand up for each other Americans, love one another, and use your tangible democratic systems of control to unseat unjust power at all levels of your society, from your workplaces board, to parent/teacher committees, Sheriffs, Chiefs of Police, Mayors, Governors, Senators, and then worry about your president. Without groundswell support for real change to your society; from one that takes and hordes wealth for the few into one that spreads love to its people, and the rest in the world. We have no hope of changing our path of destruction.